Head of the self-proclaimed Libyan National Army (LNA) held talks Saturday in Abu Dhabi with Crown Prince Sheikh Mohammed bin Zayed Al-Nahyan over “joint cooperation in combating extremism and terrorist organizations,” few days after the Libyan army general proclaimed the city of Benghazi totally liberated from terrorists. Field Marshal Khalifa Haftar discussed with the Crown Prince, who is also Deputy Supreme Commander of the UAE Armed forces, prospects of joint cooperation, reported UAE state-run news agency WAM. The visit took place few days after Haftar in a televised address announced takeover of the city of Benghazi from “terrorists”, following three years of combats supported by the UAE, one of Haftar’s close backers. A UN recent report cited the Emiratis for breaching the arms embargo imposed on Libya. The UAE, according to the report, supplied Haftar with military equipment and personnel. 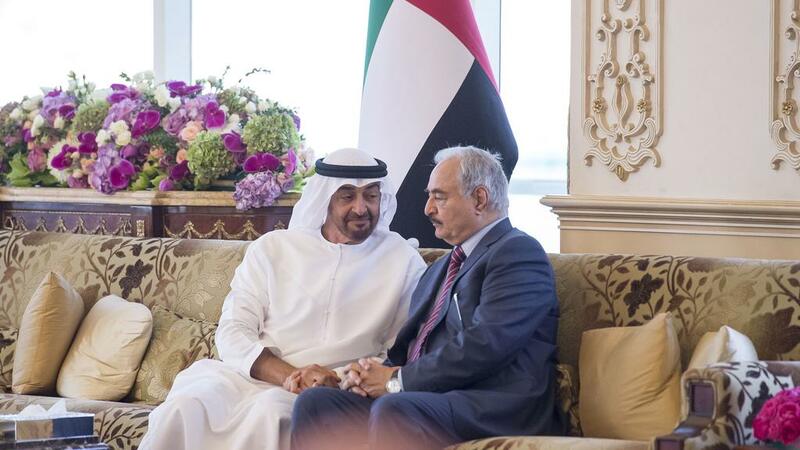 Abu Dhabi also sought to present Haftar as the right man in Libya. During a visit in Abu Dhabi in May, the Libyan army commander reportedly met with US top army officials at an encounter reportedly orchestrated by the Crown Prince’s entourage. Haftar is opposed to the UN-backed Government of National Accord (GNA) birthed from the December 2015 Libyan Political Accord (LPA) and rejects the Libyan nominal Prime Minister, Faiez Serraj, as imposed by outsiders to Libyans. He recently hinted that he would take the war against terror to the seat of the GNA, Tripoli. Written by: Jaber Ali on July 10, 2017. Posted by Jaber Ali on Jul 10 2017. Filed under Gulf News, Headlines. You can follow any responses to this entry through the RSS 2.0. Both comments and pings are currently closed.